Technically advanced high performance pharmaceutical labeling system for vials. 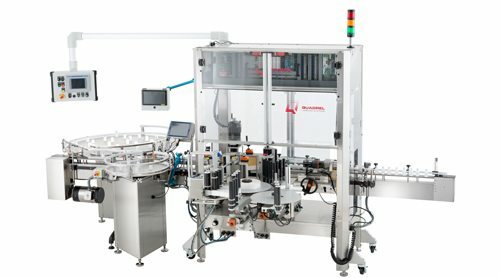 System shown with full validation package and vertical roller module for precise label placement with production rates up to 300 products per minute. This system includes code verification, a printer or imprinter, pharmacode or barcode verification, bottle and label tracking and “Assume False-Prove True” programming logic. The system’s output obtains 100% inspection for FDA compliance. Additional features include “closed-loop” servo motor label drive and dual remote powered unwind. This provides minimal label changeover time. Quadrel continues to provide quality systems to meet the stringent demands of the pharmaceutical industry.